It’s time for your curls to shine! SheaMoisture’s Coconut & Hibiscus Curl & Style Milk takes thick, curly hair styles from unruly to effortless with this blend of healthy, natural ingredients. As a leave-in moisturizer, it detangles and defines curls while restoring body and luster, giving you soft, frizz-free hair you’ll flaunt every chance you get. 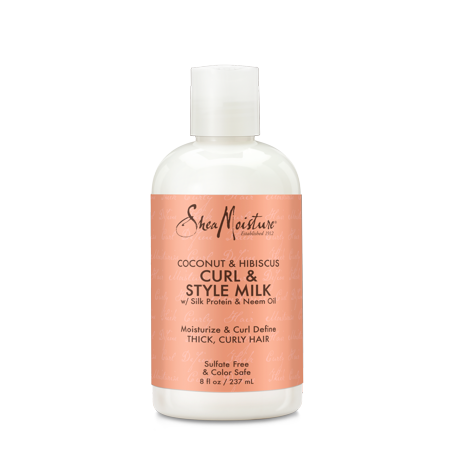 Style Milk contains Coconut Oil to hydrate and protect against hair damage and reduce breakage. Silk Protein and Neem Oil will smooth messy, wavy curls and give your frizzy hair a silky feel. Certified organic Shea Butter will transition dry, over-processed hair to healthy, beautiful curls with a warm, relaxing tropical fragrance. This leave-in moisturizer and conditioner can be used every day for enviously lustrous and easy manageable style. Many people are taking steps to introduce more natural products into their everyday lives. With all of the additives, preservatives, chemicals and extras we encounter, natural and organic are the safest routes for lifestyle changes. Join the SheaMoisture family in this endeavor that started in 1912. We utilize natural and organic as a guiding principle in creating our product lines. Sofi Tucker started selling shea nuts at the village market in Bonthe, Sierra Leone in 1912. By age 19, the widowed mother of four was selling shea butter, African black soap and her homemade hair and skin preparations all over the countryside. Sofi Tucker was our grandmother, and SheaMoisture is her legacy. With this purchase, you help empower disadvantaged women to realize a brighter, healthier future. Stop Use Indications: If irritation occurs, discontinue use. Ingredients: Deionized Water, Butyrospermum Parkii (Shea Butter)*♥, Cocos Nucifera (Coconut) Oil*, Sugar Starch, Silk Protein, Essential Oil Blend, Melia Azadirachta (Neem) Seed Oil, Caprylyl Glycol, Sorbitol Esters, Algae Extract, Hyssopus Officinalis Extract, Salvia Officinalis, (Sage) Leaf and Equisetum Arvense Extract, Daucus Carota Sativa (Carrot) Seed Oil, Lonicera Caprifolium (Honeysuckle) Flower (and) Tocopherol (Vitamin E) Hibiscus Flower Extract *Certified Organic Ingredient ♥ Fair Trade Ingredient. Natural ingredients may vary in color and consistency. I am a natural curly girl coming to you straight from Saint Louis, MO. AND OH MY!!!!!! This is by far the best product I've ever used. About a year ago I was in my friends bathroom and I *accidentaly* used this product and I WISH you would have seen my immediate reaction. This is literally THE ONLY PRODUCT that I have used besides my spray bottle of water. I wish they would make a bigger bottle ABSOLUTELY AMAZING. I have 3c hair and I would marry this item if it was a person. First off, this stuff smells AMAZING. Second, this is super moisturizing. This product helped me so much during my transition, in fact my hair didn't start retaining length until I started using this consistently. I use this on long curly mixed hair everything I have tried dries out the hair. This helps with tangles, frizz ,and makes the culs look great. Also smells amazing ! Perfect for my 2c/3a hair! My friend with 3b/3c hair loves it as well, although we have different techniques on how to use it. It didn't work for me at first but after trying different amounts and trial and era and grew to LOVE it! This has become my holy grail and i can finally wear my natural hair confidently! Not to mention it smells delicious!